Prime Minister Hon. Dean Barrow is currently giving his 2015 Budget Speech at the Meeting of the House of Representatives. You can read his speech here. Prime Minister and Minister of Finance Dean Barrow presented his 8th budget to Parliament a little after 11:00 this morning in a budget presentation that was intentionally the shortest of his administration, delegating much of the economic data and information to annexes presented with the published version of his budget speech. In a proposal that called for no new taxes, Barrow connected the national budget proposal with his administration’s “transformation” agenda – a central theme upon which his party, the ruling United Democratic Party, campaigned in the run-up to the municipal elections held 9 days ago. At the conclusion of last week’s municipal election vote, the UDP had garnered 62 of 67 seats nationally, leaving the PUP with only 5 in Orange Walk Town. “That victory, in turn, represents a massive reaffirmation of confidence in the programs, policies and economic and political stewardship of this administration. In that context, it is a joy to bring to the House and the nation a 2015/2016 budget that will ultimately be the implementation vehicle for those now imperishably popular national watchwords: the transformation continues!” Barrow said. He added that while the UDP fully expected to win those elections last week, they could hardly have imagined, let alone properly planned for, the scale of the victory. Barrow said that, “…there are clear financial implications for what happened last Wednesday. To take the two obvious examples, the citizens of Dangriga and Punta Gorda [municipalities which were previously held by the Opposition People’s United Party but which voted in full slates of UDP members] have a right to expect immediate relief from the punishing effects of the maladministration inflicted upon them by the outgoing PUP Town Councils. Among other things, it will take Central Government money to assist in their return to progress,” Barrow said. The proposed budget for 2015-2016 calls for $1.068 billion in spending, and the Government will require $174 million to take care of the financing gap, which will include $86 million in loan amortization. Most of this gap will be bridged by the PetroCaribe Fund ($73 million), but funds are also to come from Taiwan ($20 million) and previously contracted loans ($40 million), as well as domestic financing ($41 million). The bulk of the current expenditure was for wages and salaries, the single largest component, at $348 million for FY 2014/2015, and Barrow said that it is expected to increase to 40% in the medium term. Today, Barrow announced a second installment of salary increases for teachers and public servants. Although a final figure has not yet been agreed, Barrow said that the budget includes a placeholder of $20 million, enough to finance a 4% salary adjustment, on top of last year’s 6%. “And although it may end up being a little more or a little less depending on the final recurrent figure, we are so very pleased that we are once again coming through with 10 percent over two years for the stewards of our education, our administration, our security,” Barrow said. 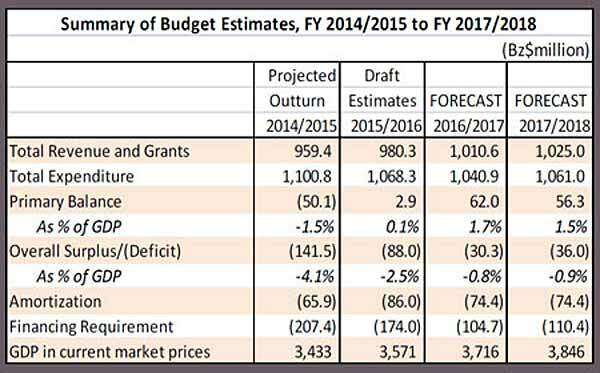 In detailing the Government’s performance on the 2014-2015 budget approved last year by Parliament, Barrow noted that they are now projecting a primary budget deficit of $50 million for the outgoing financial year, which reflects $87 million less than the $37 million surplus actually approved. 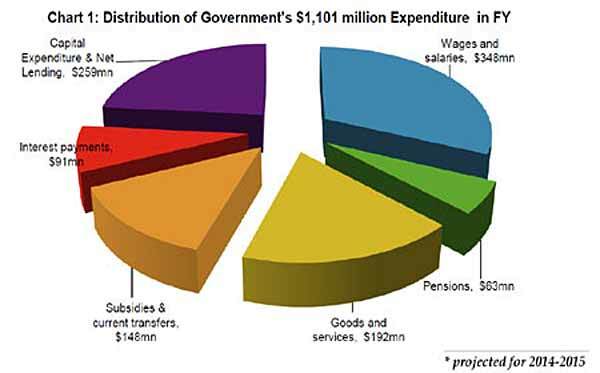 Barrow reported that the projected total expenditure for the outgoing year (2014-2015) of $1.1 billion reflects an increase of $16 million to $842 million in current expenditure and an upswing of $69 million to $258 million in capital expenditure—a substantial portion of which was financed by the funds which Venezuela has loaned to Belize under the PetroCaribe Accord. 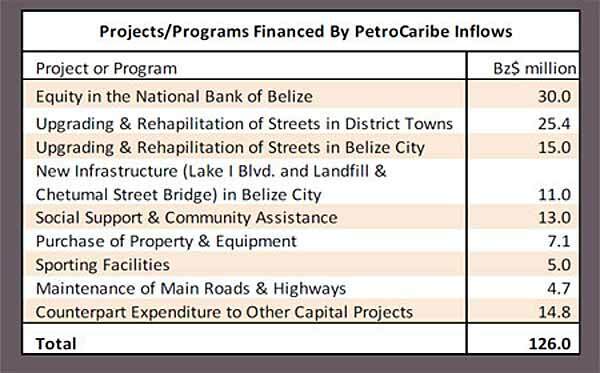 Of the BZ$286 million borrowed under the PetroCaribe Agreement, the Government has drawn down some $126 million to finance various capital programs over two fiscal years (FY 2013/2014 and FY 2014/2015), leaving a current balance of $160 million in a special account in the Central Bank. These fluctuating balances have been used to bolster our official foreign reserves to a historically high level of $974 million at the end of 2014, the Minister of Finance reported. Meanwhile, he reported that the country’s Gross Domestic Product (GDP) grew by 3.6%, as a result of higher production of export crops, record increases in tourist arrivals that boosted the services sector and higher output of electricity. Barrow’s 2015 budget is scheduled to be debated on Thursday, March 26, and Friday, March 27, 2015.